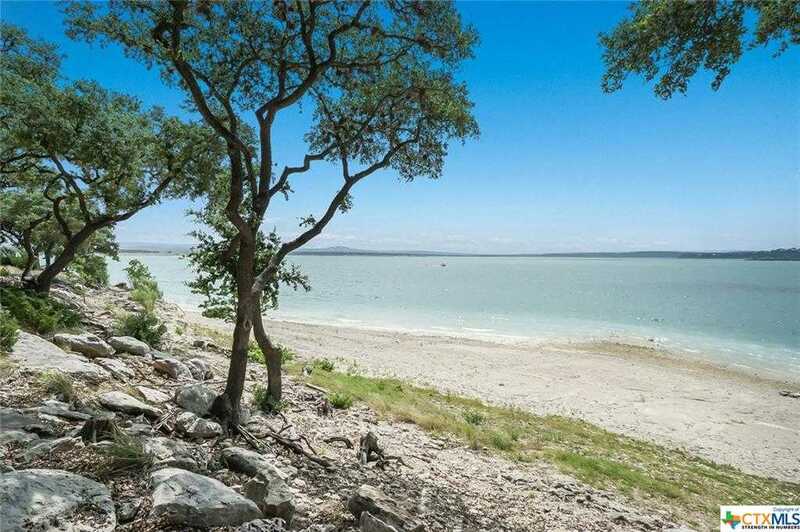 One of the Best Waterfront Lots at Canyon Lake with Stunning Views of the water. This Elegant custom home offers unparalleled craftsmanship and exceptional amenities! The Hill Country design is truly remarkable inside and out. Features include, Jenn Air appliances, granite counter tops throughout, crown molding, custom windows provide plenty of natural lighting and maximize the water views,gourmet kitchen with island, gorgeous master suite with sitting area, Jacuzzi bathtub, separate tiled shower and double vanities, two spacious living areas. This house screams &#x2018;designer&#x2019; and reflects the personality and taste of those accustomed to the best in quality design, finishes and lifestyle. Expansive decking and covered patio makes for perfect entertaining at your brand new lake house. Easy walk to the shoreline with a beautiful and highly sought after beach area. One of a Kind, come take a look! Courtesy of Blue Water Real Estate. One of the Best Waterfront Lots at Canyon Lake with Stunning Views of the water. This Elegant custom home offers unparalleled craftsmanship and exceptional amenities! The Hill Country design is truly remarkable inside and out. Features include, Jenn Air appliances, granite counter tops throughout, crown molding, custom windows provide plenty of natural lighting and maximize the water views,gourmet kitchen with island, gorgeous master suite with sitting area, Jacuzzi bathtub, separate tiled shower and double vanities, two spacious living areas. This house screams ‘designer’ and reflects the personality and taste of those accustomed to the best in quality design, finishes and lifestyle. Expansive decking and covered patio makes for perfect entertaining at your brand new lake house. Easy walk to the shoreline with a beautiful and highly sought after beach area. One of a Kind, come take a look! Please, send me more information on this property: MLS# 350355 – $1,100,000 – 314 Edge Hill, Canyon Lake, TX 78133. I would like to schedule a showing appointment for this property: MLS# 350355 – $1,100,000 – 314 Edge Hill, Canyon Lake, TX 78133.